I think I’m ready to talk about Jasper Fforde now. Well, not just about him, although I’m sure he’s a lovely person, but about his character Thursday Next and her first novel, The Eyre Affair. My first beef with this book is the flap, but since Mr. Fforde had nothing to do with that, I’ll go ahead and leave it alone. Most of you already know how I feel since I’ve been spouting opinions since I started the book a week ago. Now that I’ve finished it, I’ve got more to say. My overall feeling: the plot was good. It was original, it struck a cord (chord? what is the origin of this phrase?) with all readers who enjoy classic literature, and it ended well. As for character, I loved Thursday. She was the regular tough girl with a gun without feeling like a cliche. She had depth and a good reason to want to shoot things, but at the same time, she didn’t want to shoot things. But I cannot get over how poorly this tale was told. The first line begins, “My father had a face that could stop a clock.” Forwith, her father keeps popping in, stopping clocks all over the place. But is her father relevant to the story? No. Does he give her a bit of insight that gives her a clue to the antagonist’s whereabouts? No. Does he embody this lovely sub-plot that is a metaphor for everything else that’s going on in the story? I don’t think so. He’s just there, asking random and irrelevant questions. For the first twenty or so pages, my thought process was on a repeated loop of, “What the heck is going on?” Fforde does a great job of not explaining that he’s in this reality. Well, I guess the dodo bird kind of gave it away, but it is not that easy to just jump into an alternate reality like that and figure out what’s going on. Then for the next hundred or so pages my loop became, “Oh, this is where the story begins.” But it never did. That frustrated me. I would get really into what was going on, and then it turned out it was just a seguey into the real plot. Louis L’Amour says, “Start in the middle of the action.” It’s even a term, in media res. It doesn’t mean start in the middle of one action, then make it turn out that that action isn’t really important to the story. The actual point of the book, the “Eyre Affair” as it were, doesn’t even really begin until over halfway through the book. Granted, I liked the point of the book, and as aforementioned, I thought it ended really well, but I didn’t like taking forever to get there. If you have read this book and agree or disagree with me, feel free to comment. I welcome discussion. I would like to like this book. I really would. Convince me that it’s worth it. >Let me start by saying that I completely agree about the first twenty pages. They're rough, and not completely helpful in terms of beginning a story. However, having read the entire series (so far) I completely understand why Jasper threw in all that stuff about Thursday's dad. The rest of the series really hinges on the concept of the ChronoGuard and time travel and running from them. It's relevant. You just haven't gotten there yet. Finally, I just want to say that having read five of these novels, the whole boring- unhelpful-first-twenty-pages thing never happens again. I would suggest that you chalk it up to first novel jitters. >Thanks for the vote of confidence, Caryn. Perhaps I'll try the others some time. 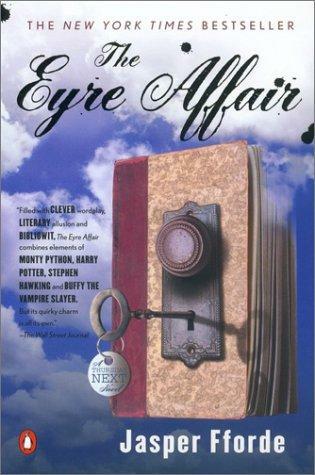 >It's been awhile since I read Eyre Affair, but I do remember a sluggish start. For me, the slow start tied to one of the first things I was told about reading Jane Eyre, which was that the first five chapters would be one of the more painful reading experiences in my life. I'm currently reading my 7th Jasper novel and eagerly awaiting the 8th. There has probably been at least once with each novel that I have been hopeless lost as to where he's taking the story. But I know I'll always get a good story out of it, and that's why I keep coming back. >Hmmm….I recently read a fantasy novel called "The Dragons of Babel," and it did the same thing you're describing: started nearly every scene in the middle of the action (yay!) but didn't deliver a plot that made sense. I spent the whole book waiting for the story to start. Courtney, remember that I did go over the parts of the book that I liked. It's wasn't all bad. I hope you don't imagine me completely bashing it with a stick, screaming, "Never again!"